For fans of the first LACOSTE X SUPREME collection, rejoice! 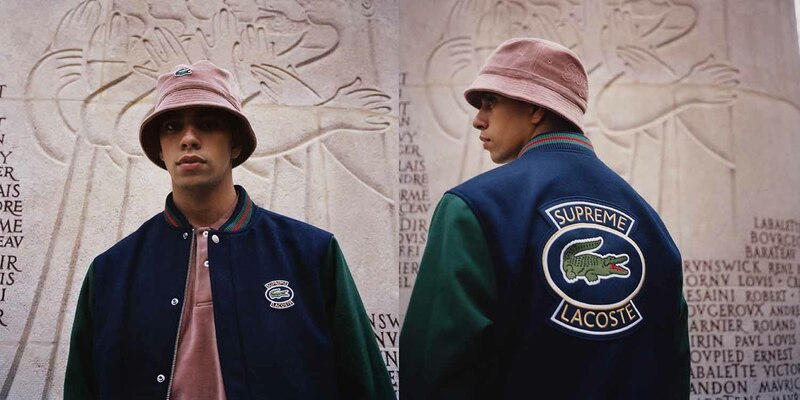 Lacoste and global streetwear brand, Supreme joined forces once more for a brand-new collection inspired by the LACOSTE archives of the 80’s and 90’s. The LACOSTE X SUPREME Spring/Summer 2018 collection consists of a Wool Varsity Jacket; Nylon Anorak and Track Pant with printed 3M® Reflective pattern; Velour Half-Zip Track Top, Polo, and Track Pant; Hooded Sweatshirt, Crewneck Sweatshirt, and Sweatshort; Velour Bucket Hat, Nylon Camp Cap and Twill 6-Panel Hat; a Waist Bag and a Shoulder Bag. While this is Lacoste’s second collaboration with SUPREME, this is the first time that the collection is being sold on LACOSTE.com. Available in-store NY, Brooklyn, LA, London, Paris, and online April 19th. Available in Japan on April 21st.